Whether you’re new to online business or you’ve been in business for a while and are new to blogging, blogging for beginners can be a period of overwhelm. You know you’re “supposed” to blog, but you have no idea how to get results from your efforts. Many small business owners start out with the old “throw spaghetti at the wall” practice. They just start writing and hope that something will stick and resonate with their audience. Your time is too valuable for this approach. If you’d like to get better results from your blog and make the most of your time, energy, and perhaps your money, then these “blogging for beginners tips” are for you. Right now, decide what you can reasonably create each week. Can you write one blog post each week? Two? Five? What’s reasonable? Yes, more is better, but not if it comes at the expense of your overall productivity, and not if your blog posts are thrown together. Quality over quantity. At Decisive Minds, our goal is to create 3 blog posts per week. One of the big ah-ha’s I had in the first year of my blogging was that I didn’t have to write or create all the blog content myself. You can have guest bloggers, ask employees to contribute to a blog post or you can create video blog posts, memes, infographics, and other blog formats that don’t require you to sit down at your computer and write. You can also outsource some of your blog content. What do you want your blog to accomplish? Each post, in general, should have a goal and a call to action. For example, if you want readers to visit you on social media so you can grow your following, then you have to invite them. If you want to build your email list, then you have to invite them to sign up and tell them why it’s valuable for them. Clarity is key. Know who your readers are, why you’re blogging, and then you can create your blog schedule. It’s important to make sure that your blog content isn’t stand-alone content and that it’s integrated into your other marketing efforts. For example, if you publish a blog post, promote it on social media with a quote from the post and an image. Blogging for beginners doesn’t have to be overwhelming or scattershot. When planning your blog content, don’t just plan a week out. Plan for the next three months. This way you can create a consistent flow of content, you can make sure that all new launches, holidays, and promotions are included in your content, and that you always know what you’re going to write about. Finally, be sure to pay attention to your analytics. It is important to know if the work you’re doing on your blog is getting you the results you want. As I said earlier, each blog post should have a call to action so here’s mine. LOL Posting the blogs is only the first part. The second is getting people to read it. 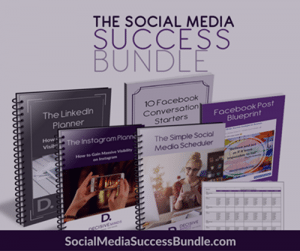 The easiest way for you to do that is to have a social media plan. I have a great resource to help you. Click below.